Adam Smith, FRS (Baptized June 5, 1723 – July 17, 1790) was a Scottish political economist, lecturer and essayist who is principally known for having authored An Inquiry into the Cause of the Wealth of Nations (1776) and The Theory of Moral Sentiments (1759). Smith is principally known for his contributions to political economy and moral philosophy; however, his writings span a broad spectrum of topics ranging from astronomy to the origin of language. Smith first achieved notoriety because of his Theory of Moral Sentiments (1759) where he emphasized the important role of sympathy in making moral decisions. In Moral Sentiments he described a moral compass within humankind that he referred to as the "impartial spectator." The "impartial spectator" led the individual to intuit right from wrong. Study of Smith's life reveals that he was an extremely sensitive man who possessed a strong sense of right and wrong that guided the way in which he conducted his life. Where Smith may have erred in Moral Sentiments was in assuming that all people shared the strong intuitive sense of right and wrong that he possessed. Smith's writing does not elaborate on how one cultivates such a sentiment although Smith did recognize the important role of formal education in shaping one's moral character. Smith's reputation further skyrocketed with his authoring of An Inquiry in to the Cause of the Wealth of Nations (1776). Wealth of Nations represents a highly critical commentary on mercantilism, the prevailing economic system of Smith's day. Mercantilism emphasized the maximizing of exports and the minimizing of imports. In Wealth of Nations, one senses Smith's passion for what is right and his concern that mercantilism benefits the wealthy and the politically powerful while it deprives the common people of the better quality and less expensive goods that would be available if protectionism ended and free trade prevailed. In Wealth of Nations Smith argues that everyone benefits from the removal of tariffs and other barriers to trade. Because of supply and demand, production will increase as demand increases. This may lead to new employment opportunities for the workforce and to collateral industries emerging in response to new demands. For example, an increase in France's wine production would also lead to an increased demand for bottles, for barrels, for cork, and an increase in shipping, thus leading to a variety of new employment opportunities. Adam Smith was convinced that the market would stimulate development, improve living conditions, reduce social strife, and create an atmosphere that was conducive to peace and human cooperation. In his view, a balance had to exist between self interest and sympathy, with sympathy being the guiding moral imperative. Competition would emerge and serve as a check to profiteering and unfair pricing. Smith makes compelling arguments for the free market and his economic and moral writings remain relevant today. Wealth of Nations serves as one of the most elegant explanations for the rapid economic growth experienced by the United States and other industrial powers in the nineteenth and twentieth centuries. Because of his own life experience, Smith's frame of reference in his writings tended to be the individual vis-a-vis the State. Smith had little appreciation of the role that the family could play in social and corporate relations and, although he had great respect for China, he did not foresee that the ethics emanating from the Confucian concept of extended family would serve as the guiding moral compass for emerging Asian economies rather than the impartial spectator that he outlined in Moral Sentiments. It should be noted that Smith developed an increasingly critical view of the Christianity of his time, partly because of his personal experiences with Christianity and surely also due to the critical view of Christianity that prevailed in the intellectual circles that shaped the Scottish Enlightenment. Smith was the son of the controller of the customs at Kirkcaldy, Fife, Scotland. The exact date of his birth is unknown, but he was baptized at Kirkcaldy on June 5, 1723, his father having died some six months previously. Around the age of 4, he was kidnapped by a band of Roma people, but he was quickly rescued by his uncle and returned to his mother. At the age of about fifteen, Smith enrolled at the University of Glasgow, studying under Francis Hutcheson, another leading figure of the Scottish Enlightenment. In 1740, Smith entered Balliol College, Oxford, but he left the university in 1746, having abandoned any interest in becoming a clergyman and generally disappointed with the quality of his Oxford education. In 1748, Smith began delivering public lectures in Edinburgh under the patronage of Lord Kames. Some of these dealt with rhetoric and belles-lettres, but later he took up the subject of "the progress of opulence," and it was then, in his middle or late 20s, that he first expounded the economic philosophy of "the obvious and simple system of natural liberty" which he was later to proclaim to the world in his Inquiry into the Nature and Causes of the Wealth of Nations. Around 1750 he met David Hume, who became one of the closest of his many friends. In 1751, Smith was appointed professor of logic at the University of Glasgow, transferring in 1752 to the chair of moral philosophy. His lectures covered the fields of ethics, rhetoric, jurisprudence, and political economy. In 1759, he published his The Theory of Moral Sentiments, embodying some of his Glasgow lectures. This work, which established Smith's reputation in his day, was concerned with how human moral behavior depends on sympathy. Smith's unique contribution to moral philosophy was his assertion that there existed within each individual what he referred to as an "impartial spectator" or a "man within the breast," and that learning to listen and respond to this guidance would lead to appropriate moral behavior. 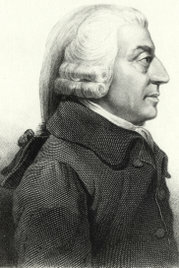 Following completion of the Theory of Moral Sentiments, which was well received in Britain and on the European continent, Smith also lectured on jurisprudence and on economics. At the end of 1763, Smith obtained a lucrative post as tutor to the young Henry Scott, 3rd Duke of Buccleuch, and his younger brother Hew Campbell Scott. Smith resigned his professorship at Glasgow but not without returning the portion of the lecturer fees that he felt that he had not earned. From 1764-1766 he traveled, mostly in France, where he came to know such intellectual leaders as Voltaire, Jean le Rond d'Alembert, Helvétius, and Francois Quesnay, the head of the Physiocratic school whose economic writings he greatly respected. Smith experienced tragedy when Hew Campbell Scott was murdered in Paris. Smith returned to Britain with Henry. Smith then returned home to Kirkcaldy where he devoted much of the next ten years of his life to his magnum opus, An Inquiry into the Nature and Causes of the Wealth of Nations, which appeared in 1776. It was very well-received and popular, and Smith became famous. In 1778, he was appointed to a comfortable post as commissioner of customs in Scotland and went to live with his mother in Edinburgh. He died there on July 17, 1790, after a painful illness. He had apparently devoted a considerable part of his income to numerous secret acts of charity. Shortly before his death Smith had nearly all his manuscripts destroyed. He only preserved those works that, in his view, made a significant contribution to human knowledge. In his last years he seemed to have been planning two major treatises, one on the theory and history of law and one on the sciences and arts. The posthumously published Essays on Philosophical Subjects (1795) probably contain parts of what would have been the latter treatise. The Wealth of Nations was influential since it did so much to create the field of economics and develop it into an autonomous systematic discipline. In the Western world, it is arguably the most influential book on the subject ever published. When the book, which has become a classic manifesto against mercantilism (the theory that large reserves of bullion are essential for economic success), appeared in 1776, there was a strong sentiment for free trade in both Britain and America. This new feeling had been born out of the economic hardships and poverty caused by the war. However, at the time of publication, not everybody was immediately convinced of the advantages of free trade: The British public and Parliament still clung to mercantilism for many years to come. The Wealth of Nations also rejects the Physiocratic school's emphasis on the importance of land; instead, Smith believed labor was tantamount, and that a division of labor would affect a great increase in production. Wealth of Nations was so successful, in fact, that it led to the abandonment of earlier economic schools, and later economists, such as Thomas Malthus and David Ricardo, focused on refining Smith's theory into what is now known as classical economics (from which modern economics evolved). Malthus expanded Smith's ruminations on overpopulation, while Ricardo believed in the "iron law of wages"—that overpopulation would prevent wages from topping the subsistence level. Smith postulated an increase of wages with an increase in production, a view considered more accurate today. One of the main points of The Wealth of Nations is that the free market, while appearing chaotic and unrestrained, is actually guided to produce the right amount and variety of goods by what Smith refers to a few times in Wealth of Nations as the "invisible hand"—which is more of an economic law than a mysterious force. If a product shortage occurs, for instance, its price rises, creating a profit margin that creates an incentive for others to enter production, eventually curing the shortage. If too many producers enter the market, the increased competition among manufacturers and increased supply would lower the price of the product to its production cost, the "natural price." Even as profits are zeroed out at the "natural price," there would be incentives to produce goods and services, as all costs of production, including compensation for the owner's labor, are also built into the price of the goods. If prices dipped below a zero profit, producers would drop out of the market; if they were above a zero profit, producers would enter the market. Smith believed that while human motives are often selfish and greedy, the competition in the free market is a check on selfishness that benefits society as a whole by keeping prices low, while still building in an incentive for a wide variety of goods and services. Nevertheless, he was wary of the greed and argued against the formation of monopolies, where greed is unchecked by market forces. Smith vigorously attacked the antiquated government restrictions which he thought were hindering industrial expansion, impeding market forces. He attacked most forms of government interference in the economic process, including tariffs, arguing that this creates inefficiency and higher prices in the long run. This theory, referred to as laissez-faire, influenced government legislation later, especially during the nineteenth century. Smith criticized a number of practices that later became associated with laissez-faire capitalism, and as such are often wrongly attributed to him, such as the power and influence of Big Business and the emphasis on capital at the expense of labor. There had been considerable controversy as to whether there was a contradiction between Smith's emphasis on sympathy in his Theory of Moral Sentiments and the key role of self-interest in the Wealth of Nations. Economist Joseph Schumpeter referred to this in German as das Adam Smith Problem. In his Moral Sentiments Smith seems to emphasize the broad synchronization of human intention and behavior under a beneficent Providence, while in the Wealth of Nations, in spite of the general theme of "the invisible hand" creating harmony out of conflicting self-interests, he finds many more occasions for pointing out cases of conflict and of the narrow selfishness of human motives. This position has been challenged by Michael Novak in The Spirit of Democratic Capitalism (1982) who takes to task those who suggest that there is a discrepancy between Smith’s moral attitude as reflected in The Wealth of Nations (1776) and the attitude which one finds in his earlier work, The Theory of Moral Sentiments (1759). Novak addresses the position advocated by late nineteenth century German and British historians of thought who held that in Wealth of Nations, Smith had supplanted the role of sympathy in moral decision-making, so emphasized in The Theory of Moral Sentiments, with self-interest. Novak points out that Moral Sentiments had six different editions. Each was carefully reviewed by Adam Smith himself. The last time Smith reviewed this work was in 1790, or fourteen years after the publication of The Wealth of Nations. For Novak, the fact that Smith had not edited his views on sympathy indicates that his views remained constant. In contrast, in the final edition of Moral Sentiments, Smith did remove the passage referring to the spiritual significance of Christ's crucifixion. The Wealth of Nations, and to a lesser extent The Theory of Moral Sentiments, have become the starting point for any defense or critique of forms of capitalism, most influentially in the writings of Marx and Humanist economists. Because capitalism is so often associated with unbridled selfishness, there is a recent movement to emphasize the moral philosophy of Smith, with its focus on sympathy with one's fellows. Smith's economic theory helped to decouple the economic sector from government control, leading to greater incentives for economic development based on protection of private property and division of labor. In a market economy where there are many competing players of similar size and economic power, for example when all businesses and farms are family owned and run, the "invisible hand" theory functioned as an approximate truth. However, Smith did not see the rise of large corporations with the legal rights of persons, which could accumulate capital, merge with other large companies, acquire smaller companies, and destroy competitors through hostile takeovers, and trump the power of individuals in democracies. These developments, which were made possible by freeing the market from government restrictions, reduce competitiveness of the market and thus the accuracy of the "invisible hand" theory. In a world in which the most powerful in the economic sphere selfishly exert control of the political sphere, a different set of injustices arise than were evident in the days of Smith, when those with the most political power selfishly interfered with the economic sector. Biography at the Concise Encyclopedia of Economics. Life of Adam Smith by John Rae, at the Library of Economics and Liberty. Grave of Adam Smith on the Famous Economists Grave Sites. This page was last modified on 1 February 2019, at 20:39.